Here, about unilateral trade agreement is explained. How does unilateral trade agreement work? Who are involved in a unilateral trade agreement? Who benefits in unilateral trade agreements? In a unilateral trade agreement, the agreement is imposed on one country, organization or groups by another. So the action or decision is taken by one of the countries, groups or organizations. Here, the unilateral agreement is benefited to one country, organization or group. Trade restriction, minimizing of imports, imposing of higher import duty and taxes etc. are imposed to such group, country or organization. So least developed countries (LDCs) are more alert on such unilateral trade agreement against the imbalance of power by developed countries. 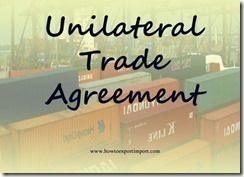 A basic idea about unilateral trade agreement is explained above. 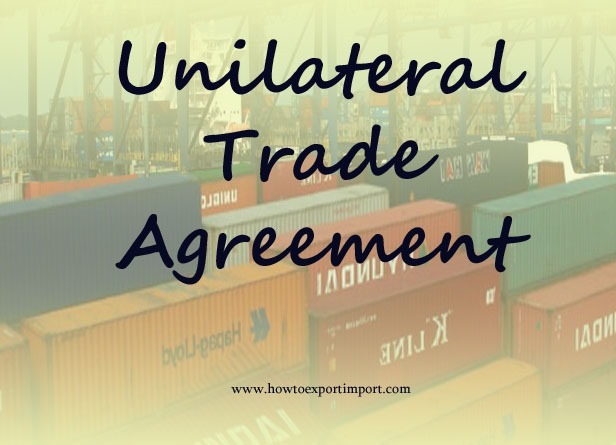 If you would like to add more information and thoughts about unilateral trade agreements, meaning and scope of unilateral trade agreements, you may share below.